Jay Leno will be emcee of this year's White House Correspondents' Association dinner. Washington (CNN) -- Comedian Jay Leno will headline the annual White House Correspondents' Association dinner in May, the group said Friday. Leno agreed earlier this month to appear at the event, before NBC announced his return to hosting "The Tonight Show," the group said. 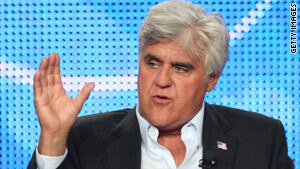 The network's move was prompted by affiliates protesting the poor ratings of Leno's prime-time show. The comedian will share the stage with President Obama at the correspondents' dinner at the Washington Hilton. By tradition, presidents fire jokes at the news corps, political opponents and even themselves at the event, where politicians, journalists and celebrities rub elbows. Leno headlined the 2004, 2000 and 1987 dinners during the administrations of both parties. Ticket sales to the dinner help fund college scholarships for aspiring journalists. More than $130,000 in scholarships, as well as journalism prizes, will be awarded at the event. Ed Henry is on the board of the White House Correspondents' Association.